Above, high school seniors work together on a critical thinking activity. Lower Savannah Council of Governments, Workforce Innovation Opportunity Act and Department of Commerce sponsored the Aiken Youth Forum at Aiken Technical College on March 7, 2019, from 9:00 am – 1:00 pm. This annual event gives high school seniors a hands on look at careers and the opportunities to meet their career goals when they graduate. Dr. Forest E. Mahan, President of Aiken Technical College, and André Anderson, Workforce Development Administrator at Lower Savannah Council of Governments, welcomed 223 high school students and chaperones. The guest speaker was Brooks Harper, author, speaker and career expert. His books, Why Should We Hire You and 7 Skills to Make Mills, are tremendous resources for students and educators. Brooks aspires to the belief that every day is an interview and an opportunity to turn learning into earning and your passion into your paycheck. SRNS, Aiken Regional Medical Center and Aiken Technical College had displays set up in the ATC gymnasium for students to view and offered hands on activities to assist students with their career choices. The students were divided into breakout sessions that included #Build Your Best Life Fair and #Build Your Best Life Skillshops and Critical Thinking Activity. [AIKEN, SC] SC Works was the official sponsor of Team South Carolina at the annual Border Bowl VI between Georgia and South Carolina. Border Bowl VI was held Saturday, January 12, 2019 at the Lucy C. Laney Memorial Stadium in Augusta, GA. The teams were comprised of the area’s top senior football players. Proceeds from the game benefitted Ronald McDonald House Charities of Augusta. Team South Carolina had a 27-18 win, which marks the third straight win for SC in the Border Bowl series. SC Works was there to celebrate with the team. As the official sponsor of Team South Carolina, SC Works staff were on hand to promote the SC Works Centers and the services offered throughout the Lower Savannah Region. The centers provide information, assistance and opportunities to workers, job seekers and employers. Their services include helping business with hiring events, hosting resume and interview workshops, finding training opportunities for job seekers and much more. “We were honored to participate in Border Bowl VI and showcase the many resources we have available to assist local Youth and their families with their workforce and training needs,” said André Anderson, LSCOG’s workforce development administrator. For more information on the SC Works centers, visit www.lowersavannahwda.org or call André Anderson at 803-649-7981. About Lower Savannah Council of Governments: Lower Savannah Council of Governments is a regional quasi-governmental organization serving Aiken, Allendale, Bamberg, Barnwell, Calhoun and Orangeburg counties. The organization strives to improve the quality of life for residents and create a sustainable future for the Lower Savannah Region. The Summer Jumpstart Program is designed to target rising high school seniors with little to no work experience, and give them a job over the summer. This year, twenty-seven (27) rising seniors were placed in work experiences with the school districts of Aiken, Denmark, Williston and Calhoun counties. The school districts acted as the work site, and students worked in various departments, such as administration, material center, maintenance, technology and communications. 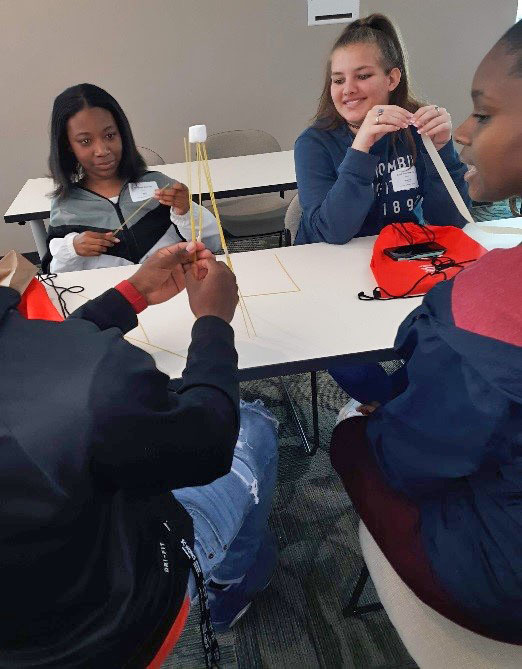 “Teaming up with our school districts to provide imperative hands-on work experiences is the key to developing young adult’s employable skill sets which are needed in the workforce,” said Megan Helmig, Youth Coordinator for Lower Savannah. Lower Savannah Workforce Development Area (LSWDA) is pleased with this extended effort and looks forward to providing more hands-on work experiences with our young adults within our communities. For more information about LSWDA’s opportunities, please visit www.lowersavannahwda.org.